This chapter covers the different ways that you can manipulate prices based on the initial List Price that you assign to an item. 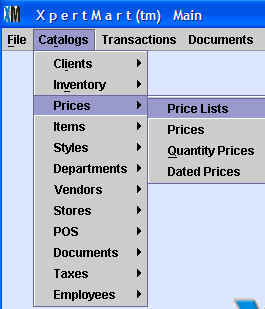 Once you create a Price List you can modify individual prices in the Prices Catalog. Subsequent chapters discuss how to setup multiple price lists; how to setup special prices by quantity; how to setup special prices for a specific date and time; how to configure XpertMart™ so that it rounds prices a certain way; and how to make mass changes to multiple prices at once. The List Price is the price of an Item that is found in the Items Catalog . This price is either entered directly into the List Price field of the Items Catalog or is automatically filled in from the Styles Catalog when you check the "Price/Cost from Style" checkbox. If you do not need to use multiple price lists or do not need to be constantly modifying prices, then the List Price is the only price information you need to enter into the system. By default, XpertMart™ always takes the List Price as the price to use in a transaction unless you have specified a different price list , or special circumstances where the price would be different, such as a special price by quantity or during a specific date . However, if you do wish to enter regularly manipulate prices and setup different price lists then the List Price serves as the "reference price," i.e. all other prices for an item are derived from this original List Price. To create a Price List, go to the Prices menu and select Price Lists. In the Price Lists Catalog you will need to give the price list a name, you will have to assign that price list to a Tax Zone and specify whether the price list will be using a Value-Added Tax (VAT). Refer to the Taxes topic for more information. If you are going to create more than one price list, refer to the Multiple Price Lists topic. 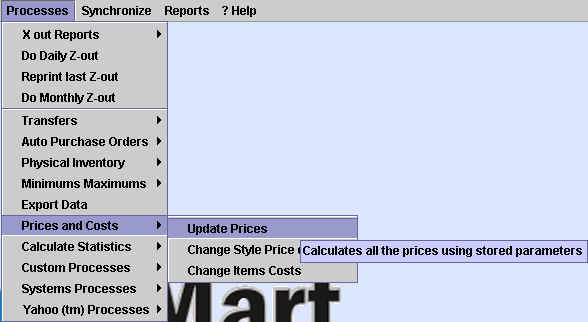 XpertMart™ stores prices for every Item in the Prices Catalog. Once you have created at least one Price List you can open the Prices Catalog to manipulate these prices. When you first open the Prices Catalog you will notice that XpertMart™ has created one entry in the Prices Catalog for every Item and that by default XpertMart™ is using the List Price as the Price to use in transactions. You can see that this is the case because the "Use List" checkbox has been selected. In the image below, notice that the List Price ($45.95) and the Price field ($45.95) are equal. However, you do not have to use the List Price as the final price of an item. You can define criteria that XpertMart ™ will use to calculate the final price instead of just taking the List Price . 1) Discount off the List Price: Takes the List Price and automatically discounts it by a percentage you define. To use this option, select the "Discount Price" checkbox and enter the discount as a percentage in the "Discount %" field. You will see the new price in the "Price" field and the discount in dollar terms in the "Discount" field. In the example below the user has entered a 15% discount which is equivalet to a $6.89 discount. The new price is $39.06. This option is useful if you are selling well-known merchandise (e.g. you have a franchise) with publicized List Prices defined by a franchisor or vendor and you want to make sure you are consistently cheaper than these. 2) Multiple of Cost: Takes the Item's Order Cost and multiplies it by a factor you define. To use this option, select the "From Cost" checkbox and enter the multiplication factor into the "Cost Multiple" field. You will see the new price in the "Price" field and the margin adjusted accordingly in the "Margin" and % Margin" fields. In the example below, the user has defined a multiple of 2.2 which yields a new price of $32.23. This option is useful if you want to keep a consistent relationship between the cost of an item and the price at which you offer it. Selecting this option ensures that your prices move accordingly whenever there are changes in the Order Cost of an Item. 3) Manually Assign a Price: This option allows you to manually assign a new price that is completely independent of the List Price . To use this option, select the "Assign Price" checkbox and enter the new price into the "Price" field. In the example below the user has assigned a price of $30.00. This option is useful when you need to match a competitor's price and you need to overwrite your old price. When you use one of these three methods to modify a price, the criteria you define are stored in the Prices Catalog. Whenever you change the List Price or Order Cost , XpertMart™ automatically recalculates the price using the criteria stored in the Prices Catalog. If you need to make lots of changes as once, use the Replace by Example tool. Note that a Merchandise Selector screen will open up when you use the Replace by Example tool letting you specify if you want the changes to apply to a certain Line or Brand or Vendor or any other filtering criteria you choose. In order to run as quickly as possible, XpertMart ™ does not immediately update prices whenever you make a change to a price, either by changing the List Price or by changing the criteria in the Prices Catalog . Instead, XpertMart™ "batches" these changes and waits for the user to run the Update Prices routine. IMPORTANT NOTE: Make sure you always Update Prices whenever you've added a new Style or Item to XpertMart™ or changed the price of exisitng Styles or Items. If you do not Update Prices, you will see $0 appear in transactions instead of the correct price of the Item. When in doubt, update! To update prices, go to the Prices and Costs menu under Processes and select Update Prices. If you are not sure when was the last time you updated prices, check the Prices Update tab of the Configure Inventory menu where the system stores the date of the last time prices were updated. If you are updating prices for the very first time, you should set the date in Prices Update tab to January 1st of the same year you began using XpertMart ™. Otherwise the system will look for any price changes starting with the default date of December 31, 1969 and the process will be a lot slower than it needs to be.